As we all know that by the release of the new Microsoft Office 2007, many users are claiming that the ribbon is not the best feature. Furthermore, many are saying that they prefer the old classic menus and toolbars from Microsoft Office 2003. Now you can bring back the familiar menus and toolbars of Office 2003 to your copy of Microsoft Office 2007 with the help of Addintools.All you have to do is install this software, and you are done! You’ll get the Classic Menu for Microsoft Office 2007. It shows the familiar classic menus and toolbars on the ribbon in Microsoft Office 2007.The software suite includes Classic Menu for Word, Excel, Access, Outlook and PowerPoint 2007.The classic menus and toolbars work fine with all versions of Microsoft Office 2007. Download and install this software and easily use the familiar main menu and the standard and formatting toolbars of Office 2003. 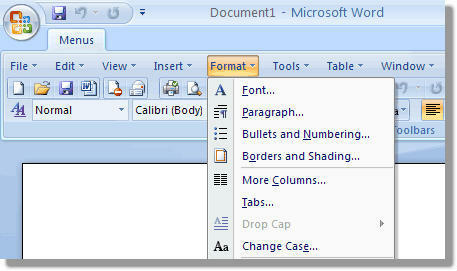 All of the new features in Microsoft Office 2007 have been added to the classic menu and toolbars. Also they are providing big discounts for enterprise and organization users.You can get the detail pricing list of volume licenses on their site.